Can a potato really fight colon cancer? I've said for years that the best way to avoid weight gain and diabetes is to stay away from white foods, such as white flour, sugar, white rice, and even potatoes. It's generally good advice, but if the thought of giving up some favorite foods is hard, I have good news. You can have your potatoes and eat them too — if you eat the purple ones! Yes, potatoes come in purple. And unlike their red or Yukon gold counterparts, it isn't just their skin that's purple. The purple hue goes all the way through. But purple potatoes aren't a dietary loophole. They're actually incredibly good for you. In fact, new research has found that purple potatoes may help you fight the second-deadliest cancer in the U.S. If you've ever tried to get rid of weeds, you know it doesn't do any good just to cut off the visible part of the plant. Unless you dig up or kill the roots, the plant will just grow right back. Cancer is very similar. You can kill off many of the cancer cells, but unless you kill the cancer's stem cells, the cancer will just grow right back. That's why attacking stem cells is one of the most powerful ways to fight cancer. And, it turns out, purple potatoes do just that to colon cancer stem cells. Colon cancer kills more than 50,000 people in the U.S. every year. But according to research published in the Journal of Nutritional Biochemistry, mice who ate the equivalent of a human adult's eating two medium or one large baked purple potato experienced a reduction in the spreading of colon cancer and an increase in cancer stem-cell deaths. The researchers are still trying to determine exactly why the potatoes have such a powerful effect. But associate professor of food sciences at Penn State and faculty member at the Penn State Hershey Cancer Institute Jairam Vanamala has some ideas. 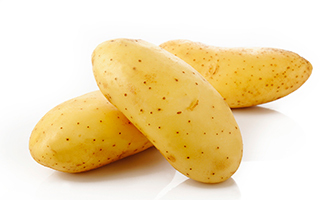 He explains, "Our earlier work and other research studies suggest that potatoes, including purple potatoes, contain resistant starch, which serves as a food for the gut bacteria that the bacteria can convert to beneficial short-chain fatty acids such as butyric acid. The butyric acid regulates immune function in the gut, suppresses chronic inflammation, and may also help to cause cancer cells to self-destruct." Even if the exact mechanisms aren't known yet, these findings are still a great reminder of why it's so important to consume a wide variety of colorful fruits and vegetables. Vanamala continues, "When you eat from the rainbow, instead of one compound, you have thousands of compounds working on different pathways to suppress the growth of cancer stem cells. Because cancer is such a complex disease, a silver bullet approach is just not possible for most cancers." I think eating "from the rainbow" of colored fruits and vegetables is a great approach. And blue and purple can be some of the less commonly consumed types. This study is a great reminder of just how powerful these colorful foods can be. Swapping white potatoes for purple is an easy trade, and the benefits are well worth it.